Arch-criminal Gru (voice of Steve Carell) and his Minions return in this Academy Award-nominated, computer-animated comedy sequel. Now living a life of domestic bliss in suburbia with adopted daughters Margo (Miranda Cosgrove), Agnes (Elsie Fisher) and Edith (Dana Gaier), Gru's world is turned upside down when he finds himself abducted by agent Lucy Wilde (Kristen Wiig) of the Anti-Villain League on the orders of boss Silas Ramsbottom (Steve Coogan). 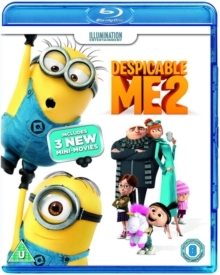 All is not what it seems, however, for with the world threatened by the new and dastardly supervillain known as Eduardo (Benjamin Bratt), it falls to the unique talents of Gru and his Minions to step up to the plate and finally save the day. The film received Oscar nominations for Best Animated Feature and Best Original Song.